Brian Eric Bonsall (December 3, 1981 – ) is a former child actor and supposed friend of Mario and Luigi's. Brian shows up at Mario Brothers Plumbing one day, carrying a suitcase. Mario and Luigi are suspicious of Brian's appearance, although Brian tries to pass himself off as a seller of many different products, including pots and pans, encyclopedias and Tupperware. However, Brian eventually breaks down and reveals that he is actually running away from home. After being questioned, Brian explains to Mario and Luigi that he is running away because he believes that his parents didn't love him anymore, and he wants them to miss him while he is gone. Mario tells Brian that he should never consider running away despite his situation at home, but Brian refuses to change his mind. Mario then tells Brian that when he and Luigi were kids that he ran away from home, and tells Brian of how Mama Mario constantly punished him for fighting with Luigi. After being punished one-too-many times, Mario ran away. Brian asks Mario if he had fun being on his own, to which he does not comply. Instead, Mario tells Brian that Luigi and Mama were devastated. However, Luigi reveals that he and Mama were able to enjoy themselves better and that they did not have to share their popcorn with Mario. Mario then returned home, and was scolded by Mama, who admitted that while she didn't miss his behavior, she did miss having him around. After hearing Mario and Luigi's story, Brian points out that since it was so beautiful, he is ready to barf. Mario then asks Brian if he learned a lesson, and Brian states that he shouldn't run away because his parents would enjoy themselves too much. Mario agrees, and Brian decides to go back home, hoping to get there before all the popcorn was finished. 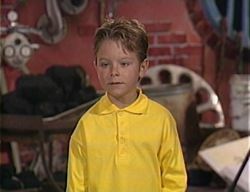 Brian Bonsall is the youngest guest star on The Super Mario Bros. Super Show! ; he was seven years old when the show was produced. This page was last edited on September 20, 2018, at 18:18.